Habit: Large shrub, 1- or multi-trunked tree, often pyramidal in youth; monoecious. Stem: young shoots or branches generally cylindric (sometimes +- 4-angled or flat), generally in 3-dimensional clusters. Leaf: opposite, 4-ranked, of 1 kind, scale-like, closely appressed, overlapping. Pollen Cone: terminal, 2--6.5 mm, 1.3--3 mm diam, generally yellow. 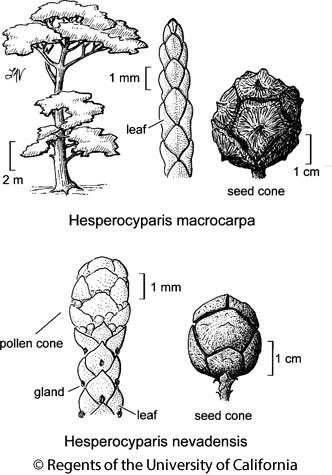 Seed Cone: 10--50 mm, woody, +- spheric to widely cylindric, maturing 2nd year, generally closed and attached beyond maturity (> 2 years); scales (4)6--12, peltate, abutting, shield- or wedge-shaped, projection generally > 1 mm especially 1st year, pointed, base level with or rising from edge. Seed: 60--150 per cone, flat, wings generally 2, vestigial; cotyledons generally 3--5. Chromosomes: 2n=22(23,24). Habit: Tree 5--12(25) m. Stem: bark fibrous, not peeling, gray- to red-brown to cherry-red; ultimate branches 1--1.2 mm diam, cylindric. Leaf: dull to gray-green; resin covering glands, conspicuous. Seed Cone: 20--30(35) mm, ovoid, often silver-gray in age; scales 6--8, projection less visible in age. Seed: 3--6 mm, generally glaucous, light to red-brown, attachment +- inconspicuous. Chromosomes: 2n=22(23). Ecology: Pinyon/juniper or oak/pine woodland, chaparral, closed-cone-cypress forest; Elevation: 750--1800 m. Bioregional Distribution: s SN (Kern, Tulare cos.). Citation for this treatment: Jim A. Bartel 2012, Hesperocyparis nevadensis, in Jepson Flora Project (eds.) Jepson eFlora, http://ucjeps.berkeley.edu/eflora/eflora_display.php?tid=89300, accessed on April 19, 2019.
s SN (Kern, Tulare cos.). Markers link to CCH specimen records. Yellow markers indicate records that may provide evidence for eFlora range revision or may have georeferencing or identification issues. Purple markers indicate specimens collected from a garden, greenhouse, or other non-wild location.